Dental injuries happen all the time, and not just during sports. Something as simple as hitting your teeth on a glass or stumbling down the stairs can severely damage your smile as well. No matter the cause, when your teeth have been chipped, broken, or cracked, you need to get help fast. You simply can’t wait a week to fix a broken smile. When you need quick, effective, and professional emergency dental care, there is only one place you need to go: Harbor East Dental. When you call us with a dental emergency, we’ll make an appointment to see you as soon as possible (preferably the same day!) Our team will walk you through first-aid over the phone to help manage your pain, and when you reach our office, we’ll bring you straight back to a treatment room. Dr. Burdusi and Dr. Betts are specially trained to handle a wide array of dental emergencies, so no matter your situation, you can trust that we’ll always be able to take care of you. Most of the time, we can complete an emergency treatment in just one visit, but if we can’t, we’ll be sure to relieve your pain and schedule a quick follow-up visit. You can trust that we’ll do everything we can to turn your emergency into a distant memory as quickly as possible. All in all, when you need dental care fast, you can always rely on Harbor East Dental. 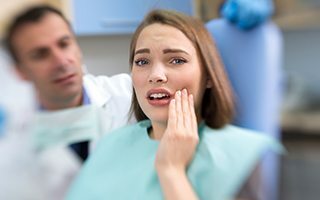 We’ll be there when you need us most, so be sure to call us if you ever find yourself in the middle of a dental emergency. We’ll be there to take care of you!